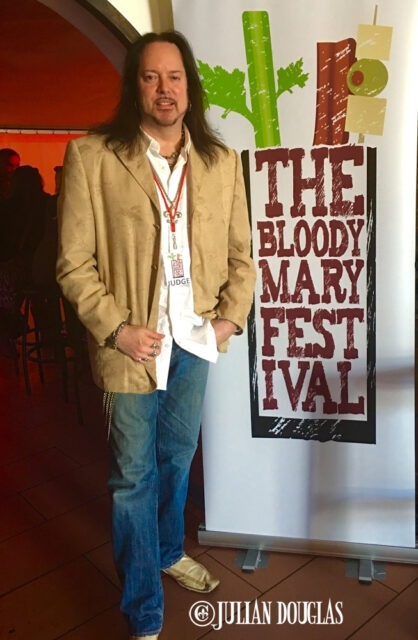 1st Annual Bloody Mary Festival, L.A. Debut. When most people think Bloody Mary, they instantly think New York City where it was perfected; thus it’s only fitting that New York City is where The Bloody Mary Festival was born. The Bloody Mary quickly became a brunch staple not only on the east coast but also the west. It’s only fitting that in a town that boasts year-round perfect weather, the Bloody Mary has become a drink which Angelenos live for, a match made in Heaven, with many versions and everyone claiming to have the best Bloody Mary in L.A. Luckily, Los Angeles didn’t have to wait too long to settle this heated debate. 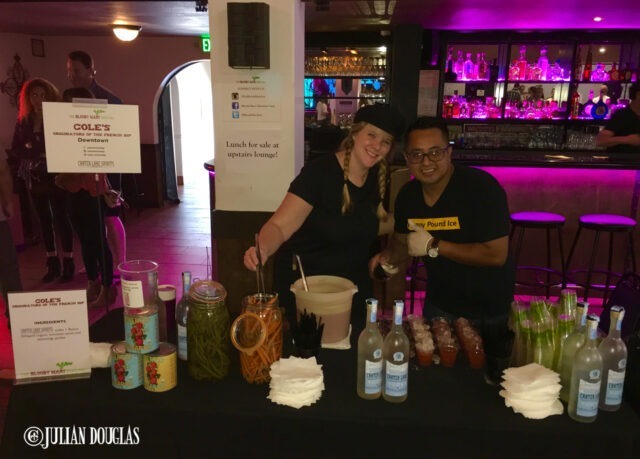 In September of 2017, the now nations sweeping festival honoring this classic concoction made its debut… The Bloody Mary Fest L.A. 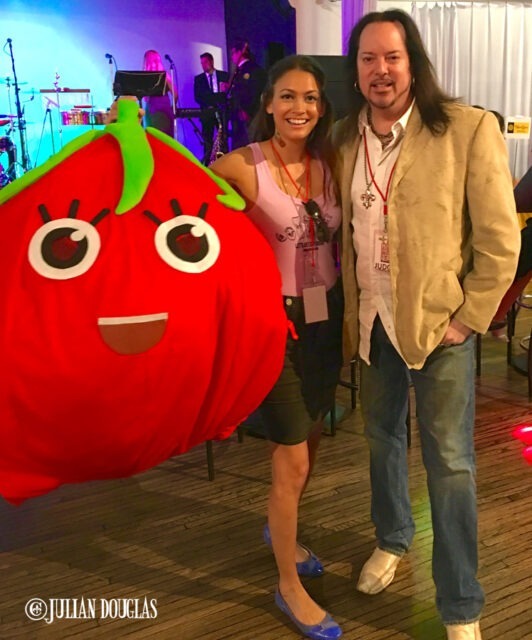 Posing with my good friend Shelly Buchanan of The Drunken Tomato, right before the famed Dancing Tomato took to the crowds. Huge thanks again to Shelley for helping me be a part of this incredible event! Though she never told me who was hidden in the Tomato later, lol. With a resurgence in the popularity of classic cocktails, spirits such as bourbon have become trendy again across the nation and craft beer continues its growing craze, one drink has slowly crept back into the spotlight, what was once a go-to hangover cure has become a multi-million dollar mixer industry. Major companies to small-batch family establishments are all vying to grab the consumers taste buds, clambering to let them know that Bloody Marys aren’t just a mix of tomato juice, Worcestershire sauce, lemon, salt and pepper topped with a stalk of celery. A prime example of why Bloody Marys have made there way across social media? Look no further than Backyard Mary’s behemoth which was on display. They’re not joking around when they say their Bloody Mary is a full meal! This especially goes for not only pubs & bars but restaurants across the country. In fact these days you will see social media lit up with the most outlandish garnishes placed atop their Bloody Marys. 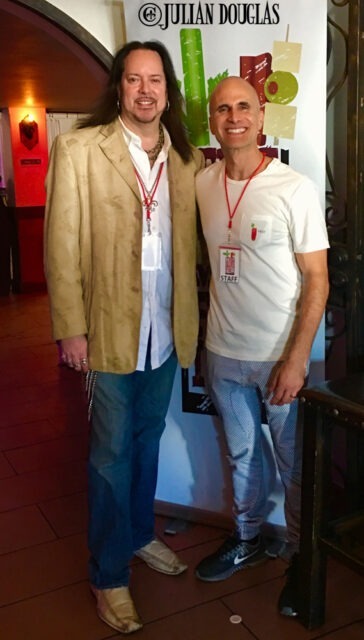 Yours truly along with the founder of the Bloody Mary Liberation Party and The Bloody Mary Festivals, Evan Weiss. We finally had a moment to breath after the day was over. That’s why about five years back, Evan Weiss and his wife Yunna formed The Bloody Mary Liberation Party (www.Facebook.com/BloodyLiberationParty). Their mission was simple, seeking out bars and restaurants making the best Bloody Marys. It wasn’t long after that The Bloody Mary Festival in Brooklyn was born. The first one was such a hit, by the time it returned for another year, more cities were added. Before they knew it they had expanded to Dallas, Denver, New Orleans, Portland, San Francisco and Washington D.C. Of course, you can’t have a drink as famous as the Bloody Mary and a city like Los Angeles, filled with some of the nations best chefs, bars and restaurants without bringing the Festival here, and that they did. In fact, at the time of this writing, they’re even heading into new cities, including Nashville, San Diego and the Twin Cities of Minneapolis/St. Paul. 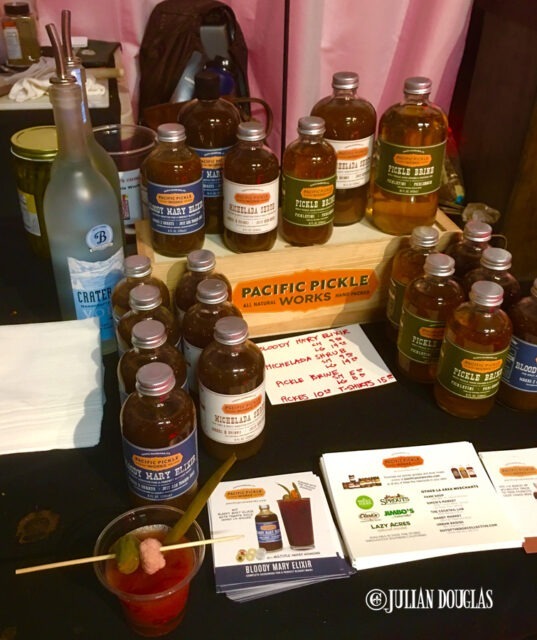 Pacific Pickle Works, like many on the day, not only were serving up their Bloody Marys but had their signature mixers for sale. What is a Bloody Mary Festival you ask? 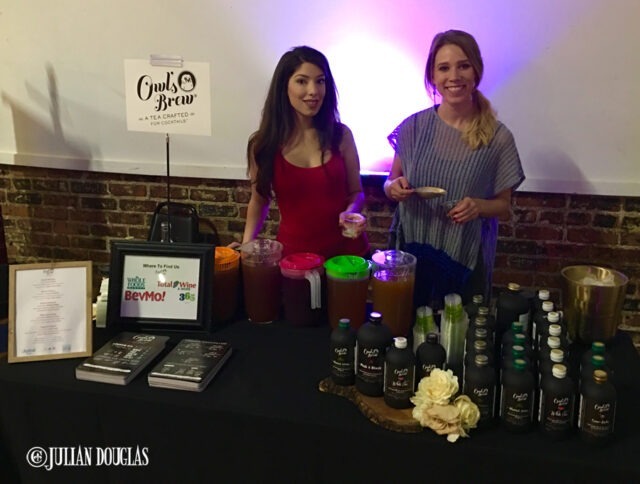 In simple terms here in L.A., it was a “celebration”, or gathering of some of the best restaurants and bars in the Los Angeles area, preparing their signature Bloody Mary, along with a few local companies who offer a pre-made mix. They gathered at Candela La Brea (www.CandelaTacoBar.com), a well known Mexican Restaurant and event hall located on La Brea in Mid Los Angeles. They would open their doors to the public to “judge” along with actual industry judges, and vote on the best Bloody Marys in L.A. 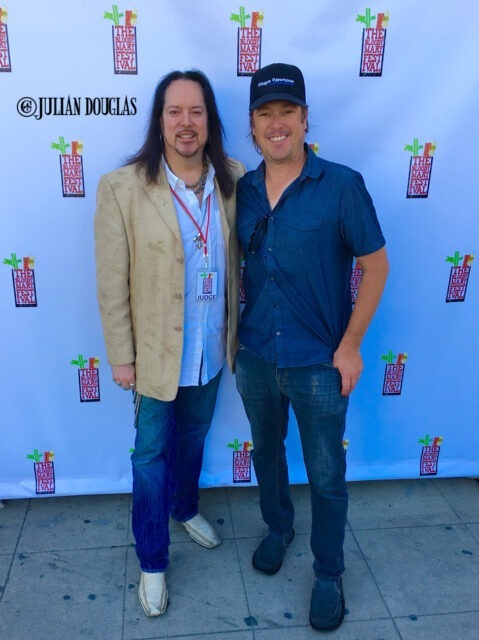 Here I am, Julian Douglas, also known as our Your Honor, Judge of The Bloody Mary Fest L.A. Seriously, it was an honor to be a judge! This was a Festival, not just a drink sampling event. It was an afternoon filled with live entertainment, food and of course drinks. The music all afternoon was performed by L.A. Orquesta Nueva Revolucion. A local band of about 14 musicians including multiple singers, percussionists and a horn section playing everything from Mariachi & Spanish hits to 80’s classics and modern day hits. 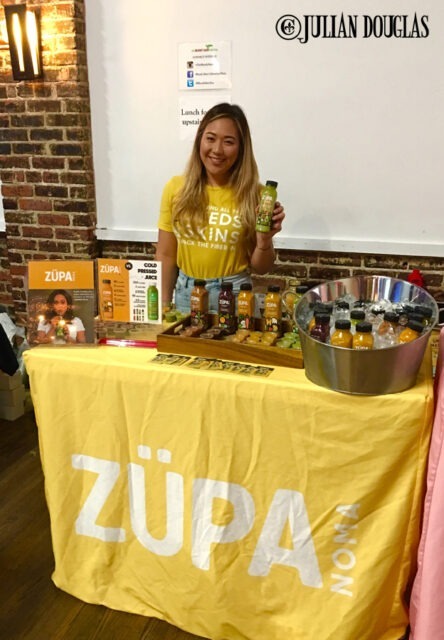 Zupa Noma was a sight for sore eyes during the day, offering samples of their super-food, all-natural soups, which also substitute as smoothies served chilled. A great way to replenish with some day drinking. Cypress Grove Cheese was swamped all day with patrons wanting to sample their famed artisanal cheeses. Featuring those produced from goats & lambs milk, one of which, their Humboldt Fog was an example everyone was asking for seconds on. There were plenty of snack varieties if you weren’t a vegetarian with Krave Jerky. 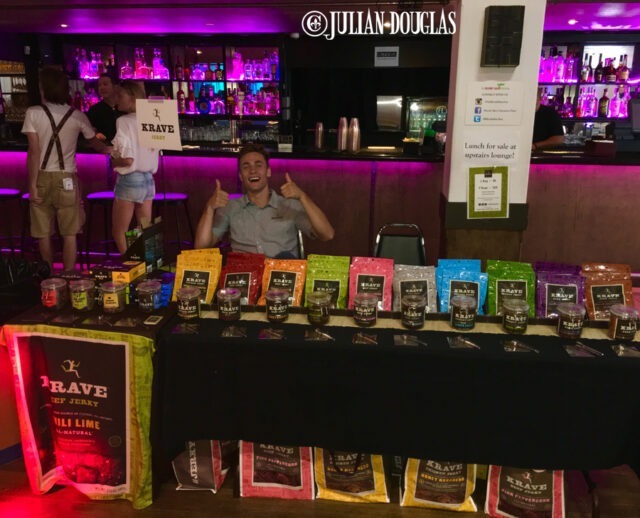 They had all kinds of incredible flavors to try of their all-natural jerky. Krave Jerky, all-natural, guilt-free jerky (www.KraveJerkey.com); Owl’s Brew, artisanal tea mixer (www.TheOwlsBrew.com); Propers Pickle, delicious, pickled vegetable slices from Long Beach, CA (www.PropersPickle.com); SmashMallow, guilt-free marshmallow snacks (www.SmashMallow.com); Topo Chico Agra Mineral water, founded in 1895 (www.TopoChico.com); and Zupa Noma, superfood soups, made from the best ingredients (www.DrinkZupa.com). 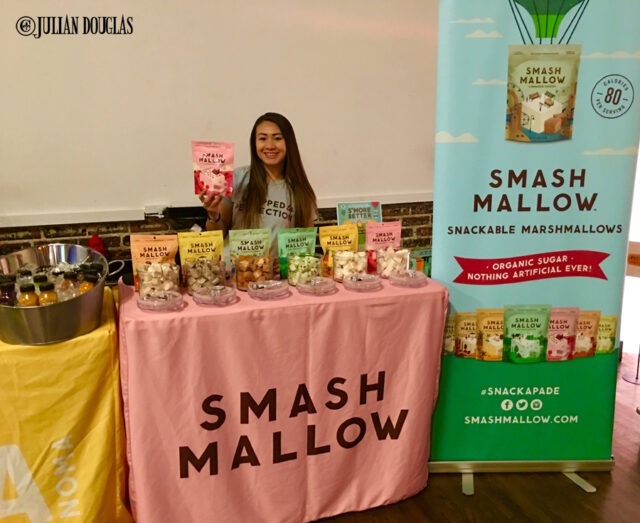 Everyone loves a sweet treat and SmashMallow was a popular spot for samples of their treats. The calm before the storm as The Attic On Broadway, based out of Long Beach, CA were had a table full of Bloody Marys filled, garnished and were ready for the doors to open. If Shayne & Lauren never showed me the bottles, I never would have believed LAVA Bloody Mary mix had come out of one. The ladies knew everything about the mix and it’s great tasting ingredients and mixed a great one too all day. LAVA Craft Cocktail Mixers in Orange County (www.DrinkLava.com); MiddleBar in Inglewood (www.MiddleBar.com); Pacific Pickle Works in Santa Barbara (www.PacificPickleWorks.com); Playa Hermosa Fish & Oyster in Hermosa Beach (www.PlayaHermosaOyster.com), Spare Tire – Kitchen & Tavern in Los Angeles (www.SpareTirePub.com); Vampire Gourmet Bloody Mary in Beverly Hills (www.VampireBloodyMary.com). 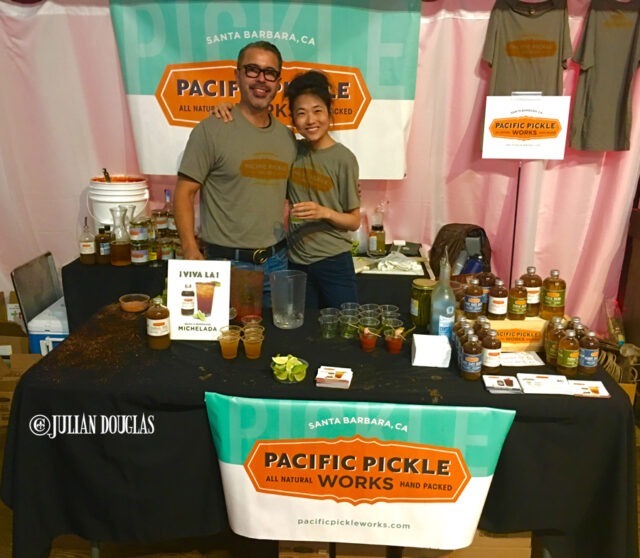 Pacific Pickle Works readying for round 2 after a crazy first event, with their Bloody Marys and all there mixers for sale as well. It was like a war zone for so many, lol. If for some reason you needed a small break from Bloody Marys, there were a couple of Michelada’s represented by Camarones Cabrones in La Puente (www.CamaronesCabrones.com) and Chinolada in Los Angeles (www.Chinolada.com). 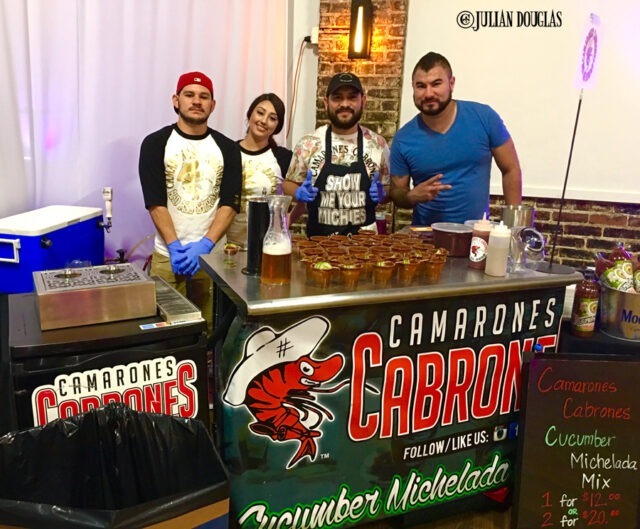 The gang from Camerones Cabrones ready for the first crowd of the day to sample their Micheladas. To keep everything on a level playing field when it came to the Vodka, Crater Lake Spirits one of the main sponsors provided just that. Crater Lake Spirits is a small company, based out of Bend, Oregon, producing handcrafted spirits including the vodka that all the contestants used (www.CraterLakeSpirits.com). Crater Lake Spirits Vodka on display and used to mix in all the Bloody Marys during the event, including here at Cole’s. Yes, Cole’s! They may be famous as the home of the “Original French Dip” but they also are known to make a mean Bloody Mary. On a picture perfect Saturday afternoon in Los Angeles on September 23rd, which happened to be two days before my Birthday (yes, a heck of a present), the doors readied to be open at noon before an unbelievable line of people waiting down La Brea Avenue. That is except yours truly. You see, I had the honor to be asked to be one of the five celebrity judges! I was joined by friend Shelley Buchanan, who’s been turning into the Queen of Bloody Marys across the nation of late. From her early days of her Bloody Mary blog The Drunken Tomato to author of several books on where to find the best Bloody Mary in select major cities, a merchandise line, to judging now all of the Festivals, and even putting on her own competition… yes, Queen she is (www.DrunkenTomato.com). We were also accompanied by industry notables, including semi-local Liz McCray of Bloody Mary Obsessed (www.BloodyMaryObsessed.com)who drove up from San Diego with her husband, Dr. Brian King of Bloody America, a psychologist who also travels the country as a stand-up comedian, flew out with his girlfriend Sarah & their adorable baby… and future judge, lol (www.BloodyAmerica.com); and Celso Oliveira of The Best Drink Ever (www.TheBestDrinkEver.com). All Rise… it’s three of the five Judges, yours truly, Shelley and Liz McCray of Bloody Mary Obsessed. And yes, it’s a very difficult job what we had to do, but we persevered. There before doors opened we had the chance to check in, gather our Judges credentials and score sheets, then go in to chat with the vendors. I went around and took a few pictures and prepared to witness the crowd that was about to besiege the event. Luckily here in L.A., the Festival was using a new format of two “seatings” if you will. There was the noon until 2:00 pm event, then they would close and give the vendors a chance to refresh, resetting and refilling for the second event for a new crowd from 2:30 pm until 4:30 pm. A smart idea which worked well, as doors opened and luckily they slowly let in the waiting crowd, which consisted of hundreds upon hundreds of people. 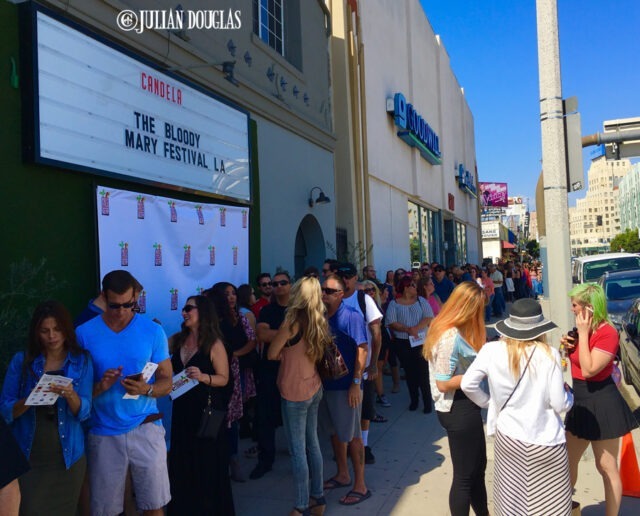 This was the scene outside at 11:30 am, a half hour before doors were opening to The Bloody Mary Fest L.A. The line went down La Brea Avenue and actually then turned the corner. And this was just the first entry of the day! Even though the crowd was slowly let in, the vendors were pounced on. All the Bloody Mary contestants were feverishly trying to refill the sample cups for the visitors to taste. Speaking of tasting, the way it worked was each person who purchased a ticket was able to sample all they like during their time at the event. They also received one poker chip to place in the bowl on the table of the maker they felt had their favorite Bloody Mary. At the end of the day, those chips would be calculated from both events or seatings, and a “Peoples Choice” Winner and Second Place would be chosen. All the hand-crafted Bloody Marys and Micheladas you can sample, all the snacks from the sponsors mentioned above and you were able to participate in a voting process… not a bad deal. For the record, the only thing you did have to pay for was the taco bar and the restaurant’s full bar if you were craving a Scotch or something. If you were craving a Scotch, I’m not sure why you were there though, lol. Did someone say snacks? 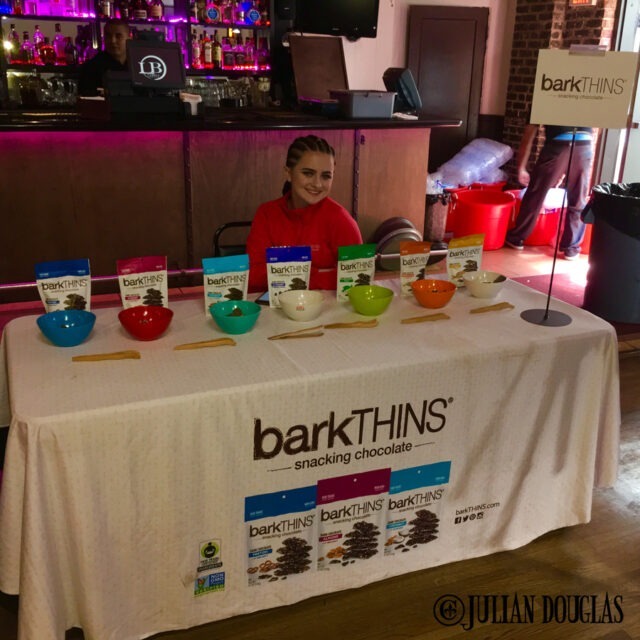 barkTHINS was at the ready with all their fair trade, non-GMO, chocolate covered treats. The big title the makers of the Bloody Marys were vying for was the Judges Pick. I have to tell you as one of the judges we took our job seriously. We all were there from 11:30 am until the event was packed up. We talked to all of the companies who had produced pre-made mixtures and had them presented as fresh as can be, garnished to impress. We got to know the restaurants and bars who entered with their signature handcrafted Bloody Marys that customers travel all around Southern California to enjoy. There’s a reason Backyard Mary is one of California’s most Award Winning Bloody Mary mixers. A flavor to go against any competitor and a crew always representing them to the best! We sipped, sampled the garnishes, licked the rims, smelled the aromas, took pictures and wrote down notes. We talked to people all day long. We watched the lines, and I do mean lines. It was fascinating to talk to some of the people who waited in some lines for up to 45 minutes to sample a certain Bloody Mary or Michelada. Some people had heard of that one and wanted to taste while others simply had the herd mentality and jumped in line just for the fact they saw so many others waiting, they felt it had to be that good. ChinoLada had the longest line of the afternoon, at times over 45 minutes. With a full-size cup with an array of fixings, it’s no wonder. During the course of the afternoon, one thing was for certain, this 1st Annual event was a huge success. People were enjoying themselves. With the band playing, food and snacks to keep people munching, plenty of drinks being served and so much fun all around, this was one great vibe. The Festival organizers were smart, covering every detail down to easy to see place cards with the Festival’s social media sites and hashtags posted (Instagram: @TheBloodyMaryFest, #TheBloodyMaryFestLA, Facebook: BloodyMaryLiberationParty, Twitter: @BloodyMaryFest). Everyone was snapping away on their smartphones & uploading their pictures from the afternoon. I had to stop by Vampire Gourmet to get a picture of their Vampire just like everyone else of course. There were lines at Vampire Gourmet to get your picture taken with their Vampire. People lining up to Snap the giant Backyard Mary with garnishes almost a foot tall containing a dozen shrimp, steak and a hard-boiled egg. 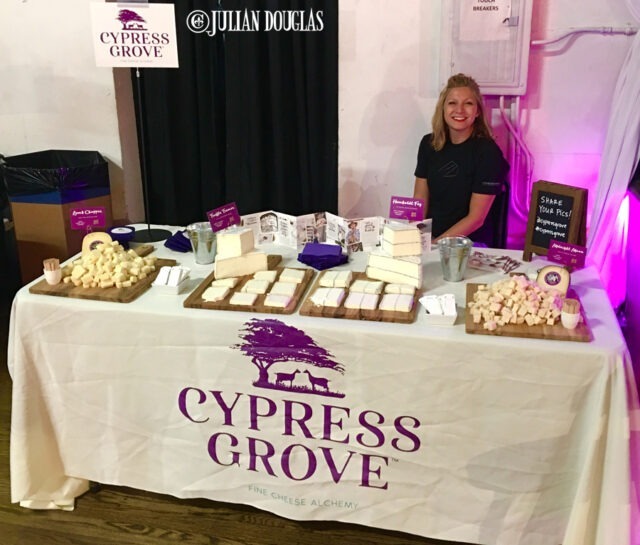 Some were hungry for the famous cheeses of Cypress Grove, hopping back in line for more, just as they were grabbing cups of the pickled veggies from Propers Pickle. These days it’s not just the “mix” when it comes to making a great Bloody Mary, it’s also about the “garnish”. 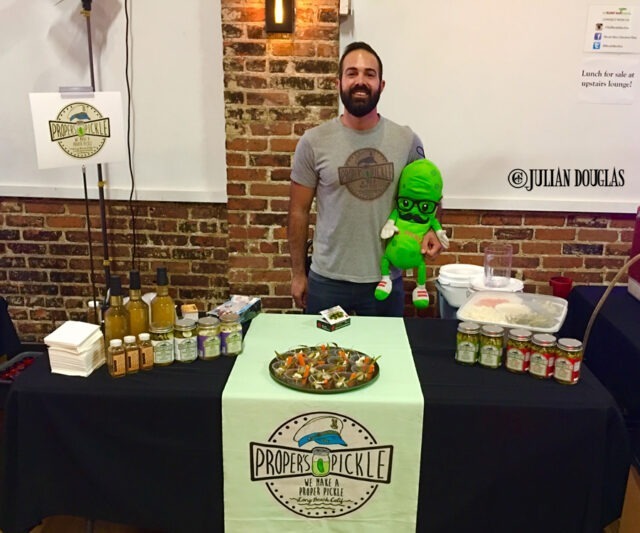 Proper’s Pickles had some truly Great Bloody Mary worthy additions! When it was time for some hydration you could grab a tall bottle of mineral water from Topo Chico. Of course, the longest lines were for the Bloody Marys and especially the longest line of the day went to Chinolada. People were waiting for over 45 minutes to get their hands on a Bloody Mary, which might have had something to do with the fact they were the only ones that served them in a full-size tumbler compared to the sample cups all the others were serving in all day. 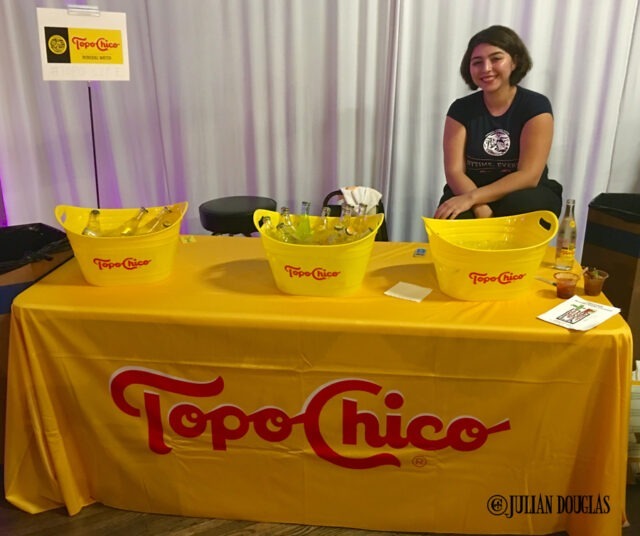 I’m not sure what everyone would have done without Topo Chico providing the great hydration throughout a day of drinking… and for us, judging. One of the busiest tables, in fact, wasn’t even serving Bloody Marys; it was the home base of The Drunken Tomato. When Shelly Buchanan wasn’t running around judging, she was with her staff talking about one of her books, keeping track of her merchandise which was flying off the shelves like hot cakes, applying the in-demand temporary tattoos or taking pictures with the giant, Dancing Tomato walking around. 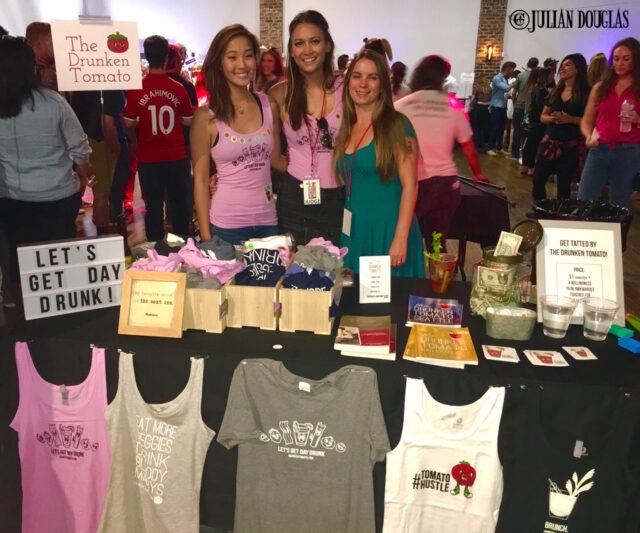 By the end of the day, Shelly Buchanan and The Drunken Tomato table had been almost sold out of all their merchandise. A true sign of just how much of a hit, and demand for the Bloody Mary culture is here in Los Angeles. A good thing she had people like Carol (left) and even judge Liz McCray (right) to help out. All in all, it truly was great to be blown away by the actual flavors from the cocktails of the day. Although I won’t specifically tell you who I voted for and in what order, I will mention a “few” that caught my attention for one reason or another… in alphabetical order of course. Backyard Mary Mixer – was one of the most popular all afternoon, you could say they had their own fan club, but it was well deserved. They knew how to work a crowd, but their Bloody Marys have had Orange County crowds coming to see them for years. Lauren and Shayne represented LAVA Craft Cocktail Mixers well. I’m sure it wasn’t easy to keep up with all those delicious garnishes and the crowds they had, let alone they knew the product. 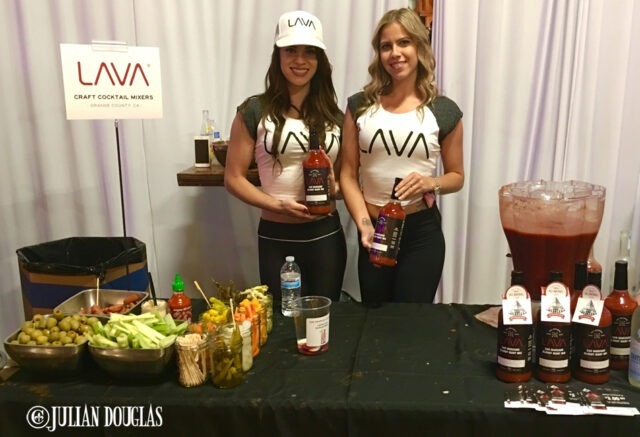 Job well done and a superb Bloody Mary mix by LAVA. 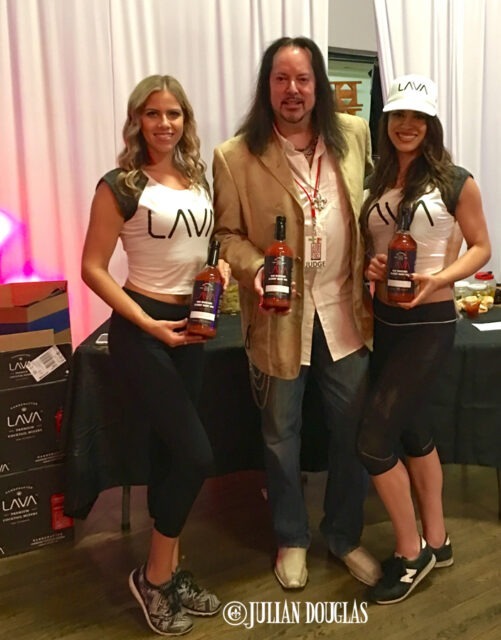 LAVA Craft Cocktail Mixers – I was stunned it came from a bottle. Of course, for most of us craving a Bloody Mary at home, that’s usually the best way for us to have one unless we’re talented enough to make one from scratch. I could have sworn they had made it fresh, not freshly opened. Maybe those Italian San Marzano tomatoes they use are the key, that and the many fresh veggie options they had to offer. MiddleBar Mary – had a reputation for a great Bloody Mary and it was great to finally see what all the talk was about; rich in flavor, a definite stand out. Playa Hermosa Fish & Oyster – the flavor from their Bloody Mary was sensational, and the simple garnish of beef jerky sticks and spicy pickle spears made this secret specialty one to remember. My Father-In-Law Marc and Mother-In-Law Jacqie came down to spend the first part of the event with me, giving me their input and having quite a great time themselves. 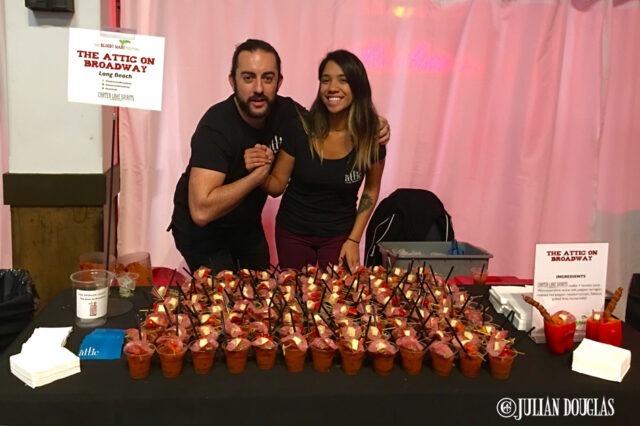 What a wonderful way to spend a day, with family & friends and great cocktails & snacks… The Bloody Mary Fest L.A. I was proud to be a part of this first Festival in Los Angeles. Running into so many people I knew brought me a lot of pride. Even my In-Laws came down to support me… well I know better, they love Bloody Marys, so they couldn’t fool me. They did have a wonderful time, as did everyone I knew and again, all those I actually was able to talk to. I made a point to talk to many, especially getting their take on the cocktails of the day. And as the day was coming to a close, we the judges at different times read over our notes, tallied our scores, each picked our personal favorites and handed in our sheets. Later after closing a few of us compared notes, and I found it amazing that at least 3 of us that chatted had almost the exact same opinions. That is consistency, to say the least. We were then told that later that night on social media the winners would be announced. Anticipation was killing me but not near as much as all those who entered I’m sure. At the same time, it was a long and grueling day. Between the prepping the days before, the morning of, the event itself, then the breaking down, I’m sure they were all exhausted and ready to head home and just wait for the announcement. Owl’s Brew joined the party to show you didn’t have to have a Bloody Mary to enjoy a refreshing cocktail. I did talk about what a big success the first year of the Festival in Los Angeles was, which is why they already were talking about ideas for the second Annual Fest. Bigger you can bet with I would imagine much more entering to battle for the title of Best Bloody Mary in L.A. You can easily see the crowds coming in larger amounts, along with companies wanting to be a part of this fantastic event. I’ve heard rumors already of judging of categories on best “original” recipe & “traditional” recipe for example. So, stay tuned for announcements and updates as they start to roll in. You can bet I hope to be back again and if you weren’t there, you should make your plans to get a ticket in advance before they sell out. 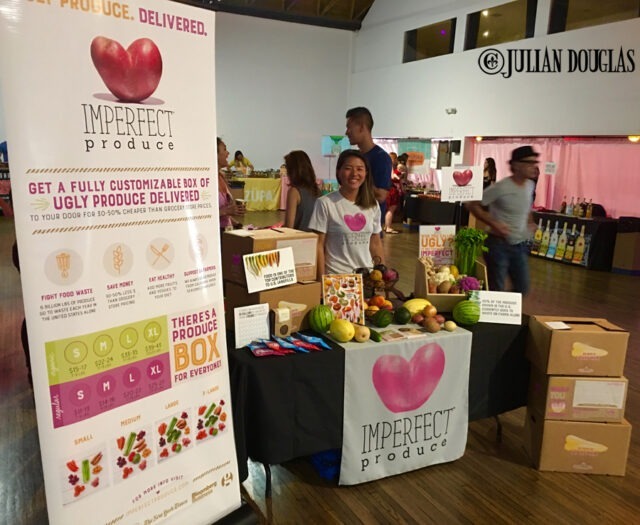 If you haven’t checked out Imperfect Produce you should. They’re on a great mission, and a fantastic group to have at The Bloody Mary Fest, especially in a location as Los Angeles. Now I’m sure the moment you all were waiting for, what were the results of all that voting, from the judges to everyone in attendance. 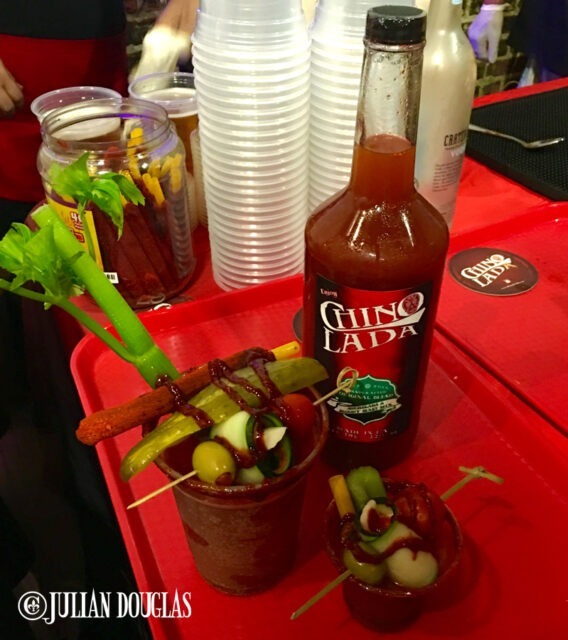 Who now holds the crown, the title, from the first Annual Bloody Mary Fest… who has the BEST BLOODY MARY? Playa Hermosa Fish & Oyster in Hermosa Beach, CA. 2nd Place: MiddleBar in Inglewood, CA. 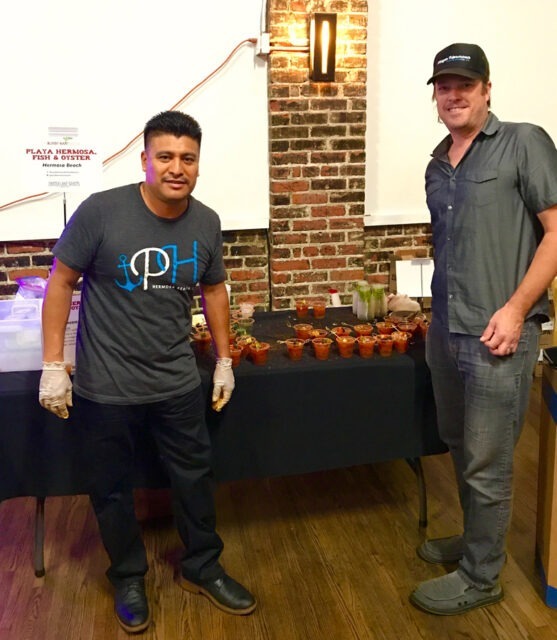 The proud Winners of Best Bloody Mary in L.A., Playa Hermosa Fish & Oyster from Hermosa Beach, CA. 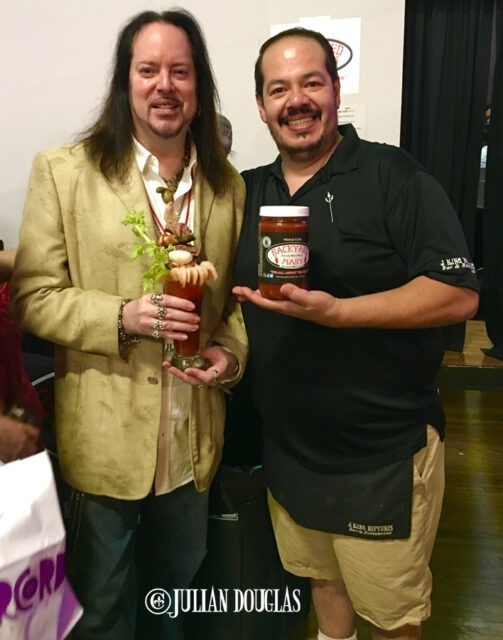 Owner Levi Lupercino (right) along with Javier (left) went non-stop all day making sure every patron had a chance to taste their renowned Bloody Marys that people head to the beach to try… and it paid off. Congrats !!!! (picture courtesy of Playa Hermosa). Winner: MiddleBar in Inglewood, CA. 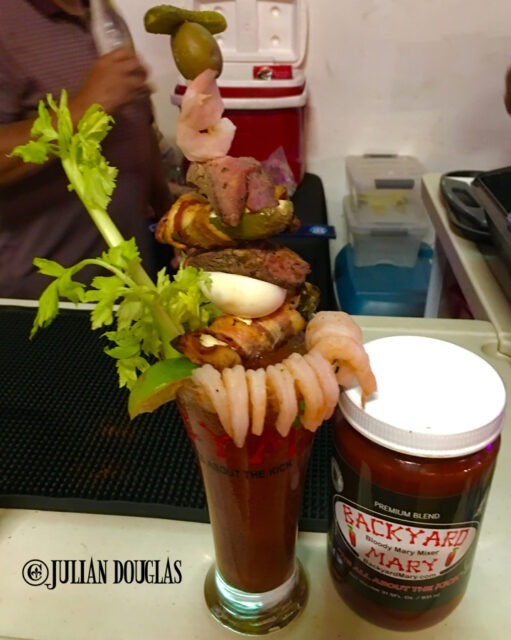 2nd Place: Backyard Mary in Sunset Beach, CA. 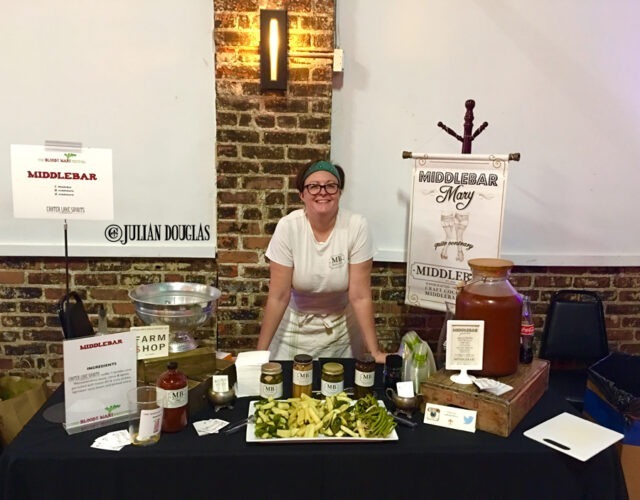 Corrie from MiddleBar on Market in Inglewood, before the day began, with their great assortment of garnishes which just added them eventually earning Winner of the People’s Choice Award. Winner: (tie) Camerones Cabrones in La Puente, CA and Chinolada in Los Angeles, CA. 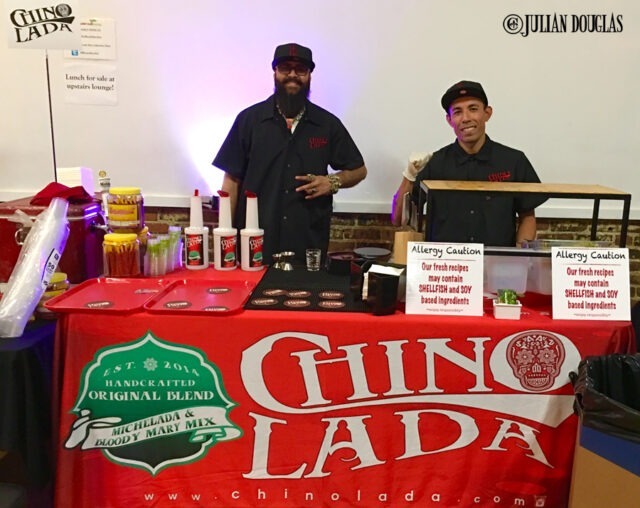 With lines of 45 minutes & more all day, there was no doubt ChinoLada would be one of the Winners for Best Michelada. There you have it, congratulations to Playa Hermosa Fish & Oyster on Winning the first Annual Bloody Mary Fest. It was well deserved and I strongly suggest you head down to Hermosa Beach to not only try the “Best Bloody Mary in L.A.”, but all of the great Bloody Marys that were a part of this incredible day. 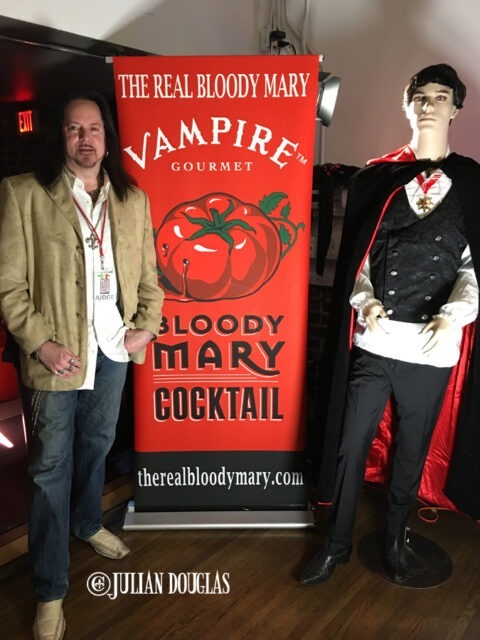 I also want to again thank Evan & Yunna, Shelley and everyone that had a roll in The Bloody Mary Fest, it was an honor to serve as a judge and be a part of this historic day. I had the chance after the Festival to pose outside to one the more popular spots, the backdrop, with soon-to-be Winner, Levi Lupercino of Playa Hermosa Fish & Oyster. THE BLOODY MARY FEST L.A.